An often overlooked class of materials is beginning to have a major impact on the solar energy world and may be a valuable tool in hydrogen fuel production. Researchers from the Ecole Polytechnique Federale de Lausanne in Switzerland have built a new photovoltaic device using perovskites, materials that have been found to be more efficient and less expensive than silicon. The photovoltaic device uses the power of sunlight in order to generate hydrogen fuel. The device uses solar energy to split water into its component parts of oxygen and hydrogen. According to researchers, the device is able to do this with 12.3% efficiency. 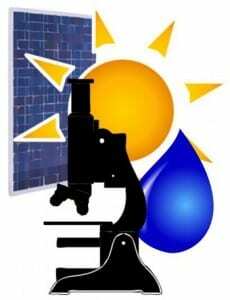 When it comes to hydrogen production using solar power, the standard for the process being considered viable stands at 10%. Anything below the standard is not considered a usable solution. The new device may have significant implications when it comes to the future of hydrogen. Hydrogen fuel is becoming quite popular, especially in the transportation space. While fuel cells themselves are quite expensive, the cost and efficiency of conventional hydrogen production systems is also considered a major problem slowing the adoption of hydrogen as a viable energy source. Finding better ways to produce hydrogen has become a major priority for those interested in renewable energy and many efforts to address the production problem have focused on cost. While the perovskite device has proven that it can be more efficient than its conventional counterparts, the device is more fragile than those made from silicon. It may take years before the device is ready to see commercial use of any kind, and by the time it is considered viable there may already be a better solution available. Time will tell whether or not this breakthrough in solar-hydrogen production will manage to have a significant impact on the renewable energy world.